Types of Art: All Senufo art is made by specialized artisans, which may diminish regional stylistic differences. Figures representing the ancestors are common, as are brass miniatures and small statues, which are used in divination. There are several types of masks used by the Poro society. 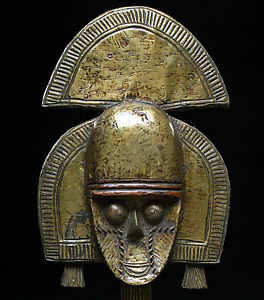 Religion: There are a number of revered ancestor and bush spirits among the Senufo. Maleeo and Kolotyolo ("Ancient Mother" and "Creator God") represent a dualistic deity. Kolotyolo is not approachable and can only be reached through Yiriigifolo or Nyehene. In the region of Kufulo, Maleeo is represented by the sacred drums before whom all thieves and murderers are brought for trial. The Poro society is reserved primarily for men, although young girls and postmenopausal women are permitted to join. The main function of Poro is to guarantee a good relationship between the living world and the ancestors. Nerejao is an ancestress who is recognized as the true head of the Poro society. Divination, which is governed by the Sandogo society, is also an important part of Senufo religion. Although Sandogo is usually considered a women's society, men who are called to the profession and inherit through the matrilineal line are permitted to become diviners.